Probably the world's most prolific wild rainbow trout fishery? 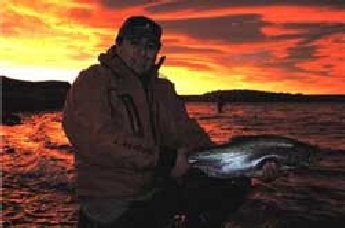 Although only in my mid 30's I have been an avid fisherman since childhood. During that time I have spent much time listening to older generations reminiscing about days gone by when our home rivers teemed with vast quantities of fish. My generation has, however for the better part seemed to have been blighted by tales that used to start with 'it used to be' and ended with 'a shadow of its former glory'. Even those who are not versed with the subtle art of the angle are aware that many a fishing story is subject to 'significant' elaboration. What was five pounds becomes five kilos and five fish touched becomes five fish on the bank. The tale above seemed to have been subject not just to an individual's wishful thinking but rather successive generations of finely crafted tales each one better and bigger than the previous. However, inquisitive as a cat I resolved to see for myself if this place was simply folklore or if a place really did exist where the fish took as readily as the greediest trout in the height of a mayfly hatch and if they really were flawlessly wild, silver as if they had run from the sea and some so fat they could only resemble rugby balls. One year later from the small town of Piedra Buena near the mouth of the Santa Cruz River we embarked on our journey to Jurassic Lake. Now there is a reason behind most things and the reason why this lake had gone relatively unnoticed is because it is the route that takes you across some of the most barren wastelands on the planet. Gravel tracks make up five hours of the journey however after that you leave all trace of civilisation and jar and jolt your way over a desolate and seemingly unending lava field. 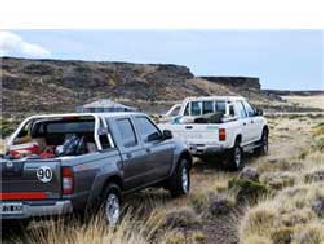 The trip is punctuated by the occasional fox which stares at you incredulously and certainly fearlessly, wild ponies which roam carelessly amidst the scrub and even a huge hole gouged in the pancake flat terrain by what can only have been a meteor impact from another time. Anticipation is a powerful cure for life's hardships and so despite the jolts time glided by and eventually we were confronted with a lake so blue that its appearance was akin to the deep blue of the Caribbean Sea. With just an hour of light, as the sun dipped low and the sky took on a threatening fire red appearance, we cast our first flies. Prepared and eager I was first in the water. 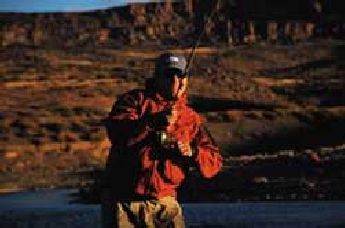 Second cast, my line hesitated and then… bang, a mighty silver trout broke the surface of the lake in a clatter of spray and an explosion of sound as my reel burst into song. The rod arched, my guide Pollo whooped, the others looked on incredulously and I suddenly started believing. My first fish fought in a manner that those who are used to catching oversized rainbows in trout farms can only dream of. Long searing runs and Tarponesque acrobatics. That fish probably weighed 12 lbs and by the time the others had got their lines in the water I was on my third fish and this must have weighed 20 lbs. After that it was simply a matter of pursuing your favourite technique or style. We caught fish on size four cone head woolly buggers and size 14 nymphs. We used floating and intermediate lines. We fished dry flies in the small river that enters the lake where a single sudden move makes the water quite simply erupt as fish scatter in all directions. You can fish constantly until your arm aches or you can catch a couple, stand back and take stock of this truly incredible place and then jump straight back in where you started. I should at this stage mention that the whole lake does not have quite the same concentrations of fish as where we were fishing. It would appear that the fish concentrate around the mouth and the lower reach of the river as they jostle for the opportunity to spawn. The quantities of fish however mean that they have developed their own unique spawning habits. Rather than spawning seasonally they do so throughout the year. Such is the competition they have developed their own unique ecology in this unique environment. Outside of their individual spawning cycle they roam the lake, which is absolutely crystal clear, gorging on a type of freshwater krill and growing fat to an extent that you have to see to imagine. 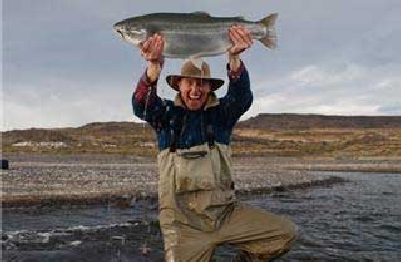 Is the fishing easy…..the answer is absurdly so. 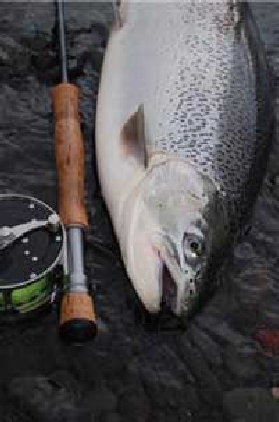 Do you have to be a proficient and skilled angler……simply the answer is a no. Would you want to spend more than a couple of days here……probably not. Is it one of the most unbelievably fishing experiences you are likely ever to come across, an adventure that makes the travel worth it and an insight into what happens when nature conspires to create perfect conditions for a particular species…..a resounding yes. It is Jurassic Lake!